Our Pinpoint Family has been serving North County for more than 40 Years! All of our technicians are fully licensed, thoroughly trained, with state of the art equipment and materials. I chose Pinpoint because they were local and had a great rating. They did not disappoint! Friendly service from Josh and a great explanation of the services. Pet and child safe pesticides for those pesky ants will keep a smile on my face all summer! Excellent service at a reasonable price. PPC even accommodates our dogs so that they (the dogs) will be comfortable with PPC technicians entering our yard. They helped us when our backyard garden became over run with rats. We now have a rat free yard. Couldn’t be happier. We are very pleased with prompt, professional service, and reasonable price. Highly recommended. Signing up for service was so easy. In fact. Since a service technician was in the neighborhood I was able to start service the same day. Since this sevice I have not seen any ants and two days after the service I found 3 dead black widows on the patio. I am looking forward to an ant free summer. We have used Pinpoint Pest Control for years. They have helped us with bird mites two different years and are always so helpful with how traumatic it is for the client. We have been on their yearly service several times over the past 10 years. They always respond to any phone call messages I leave regarding an unusual bug or mite situation. Pinpoint is a very dependable and honest company. 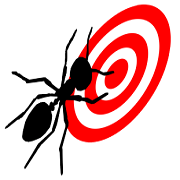 Pinpoint was very professional in the way they explained the ant problem we had and in the way they treated the home. I would recommend them for your pest control needs. Generally, I don't do reviews unless a company does well above and beyond my expectations. Pinpoint Pest absolutely delivers on this. They are friendly, reliable, easy to work with, and always communicate with me. I love these guys! Perfectly happy with Pinpoint. Excellent professional service from the 1st phone call to the monthly service. I have been a customer for many years. They are dependable, reasonably priced, and great to work with. And they are nice people too! Whenever I need Pinpoint at any of our multiple locations, they are quick to get the job done! Friendly, professional, and always happy to help! I have been using Pinpoint Pest Control for over 10 years and they are reliable and do an excellent job keeping the pests out of out house. We've been happy customers of Pinpoint for many years. Pinpoint has been quick to respond to any and all of our special needs and requests. It has been with complete confidence that we have recommended them to friends and neighbors. Always friendly and get the job done. Pin Point has been servicing my home for many years now. They are efficient, clean, friendly and effective. I wouldn't trade them for anyone else. Great job guys! Excellent service, fast, professional and affordable. I have been very pleased with Pinpoint Pest Control from the initial contact to service. In the initial phone call, they were very helpful in describing the various options and the gentleman was not pushy at all. I had a problem with ants and spiders. The service works and my backyard got cleaned up. Their prices are competitive and reasonable. I highly recommend them. We have been using Pinpoint for three years and they are just the best. They're very dependable and responsive whenever I have a request or a question. I also really like that they are so knowledgable about the local biome and take the time to educate me about effective ways to keep pests out of our house. Great service and response time! Pinpoint was helpful, responsive, efficient, and effective. Also nice. Highly recommended. The Pinpoint team gave us quick and thorough service for insects and rodents. Very knowledgeable and prompt in their visits. We would highly recommend them. Digital risk jobs got rid of ants & scorpions. The team at PinPoint is always responsive. They were able to come out and eradicate my ants within 24 hours. They are great about calling prior to service so I know someone will be here. My prior pest control service was difficult to get ahold of and often didn't show up within the window promised. These guys are awesome! Tyler came right on time and was in and out in no time. I haven't seen an ant since. Pinpoint is friendly, efficient, and professional. I would call them again in a heartbeat! I was very satisfied with pinpoint pest control. Their service was prompt and professional and I’ve not seen ant since they came out. I would highly recommend this company. I feel they are trustworthy, reasonable, and they know what they’re doing . The Pinpoint team is professional, knowledgable, thorough, prompt to respond, and trustworthy. I appreciate their help and quality service!! NO BUGS OR ANTS AFTER 2ND TREATMENT. Great response time, professional staff, and when the treatment didn't seem to quite get rid of ants the first time they returned to do it again. I've used Pinpoint multiple times and they always do a thorough job. Lots of crickets inside and out. All gone! Decent pricing and nice people. Highly recommend. Super nice team. Very responsive and professional! Brian was so informative and helpful with our situation. We are so pleased with Pinpoint and their service. We have recommended them to our family. Excellent service. Friendly, knowledgeable,helpful . Brian was great. Definitely recommend Pinpoint Pest Control. I am very pleased with your work and happy to say that I am no longer sharing my house with thousand of uninvited ants! Pinpoint has been a great service so far. They are available to educate and help with any insect infestation. This has been the worst season I have ever encountered. Now, I wake up with no worries about finding ants in my kitchen or bathroom! Love the products that are not poisonous to my dog or little ones! We had a great experience with Pinpoint Pest Control. We were having ant problems in the warm weather. They came out and sprayed and also helped lay traps inside the home. Our ants have disappeared! Tyler who came onsite was very professional and courteous. We couldn't have asked for better service! Fast, professional, and reliable. Provided effective advice and recommendations to control pesky ants and followed up with onsite treatments. Ten days later....and still 100% ant free. Couldn't be a happier and recommend with confidence. I will definitely be using these guys again. -M.
As a senior citizen, I am always happy when I am treated with patience and courtesy. Pin Point Pest Control was efficient, knowledgeable and thoughtful.It is my pleasure to recommend them for pest control. Great service! Haven't seen an ant since we got the "one shot" treatment. Would highly recommend if you have an ant problem. The Pinpoint Pest Control team was so responsive and informative! They came out to service our home within a few hours of calling and have followed up several times to ensure make sure they eliminated our ant problem. Highly recommend!